A seal found stranded 20 miles from the ocean in a farmer’s field has been transferred to a rehabilitation center, where staff have decided to name the animal Dumbledore, after the famed Harry Potter character. The seal was discovered in Newton-le-Willows, near St. Helens in Merseyside on Monday morning, according to the Telegraph, after becoming desperately lost and clambering into the field from a nearby brook. 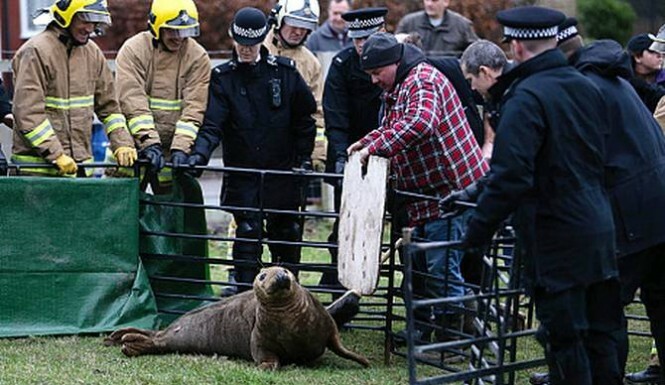 A dog-walker stumbled upon the seal, which authorities described as “distressed,” around 9:45 a.m., sparking a rescue operation that included emergency services and the RSPCA. The animal was transferred to the RSPCA’s specialist seal treatment facility in East Winch, Norfolk, on Tuesday. Alison Charles, manager of RSPCA East Winch, noted that staff had given the seal a new name, based on their current theme. The facility names the animals that come into their care according to a popular theme, according to the Independent. The current theme centers around Harry Potter characters, which is why the staff decided to call the seal Dumbledore. Over the last few years, a colony of seals off the English coast have formed an unlikely bond with a local diver. 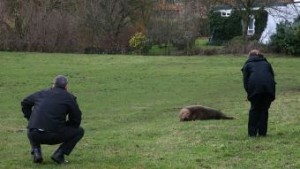 As the Inquisitr previously reported, several videos of the interactions between Ben Burville and the seals have gone viral.Dumbledore will remain at the seal treatment facility into the new year, as staff caution it will take some time before he is released back into the wild.